The Wanhao Duplicator i3 working on a part for an engineering project. (6/16) Recently my son convinced me that the museum needed a 3D printer. To be honest, I'd already been thinking about the usefulness of one for a while already to fabricate art objects and various parts. He's a mechanical engineering student and he thought that having one might also be helpful for his senior project. For those not familiar with what a 3D printer is, the name is very appropriate. A 2 dimensional printer creates things on paper with only two dimensions - length and width. A piece of paper can be long and wide, but for all practical purposes has no height. As a 2D printer moves its head over the paper, it lays down ink where needed to create a letter or an image. A three dimensional printer pretty much does the same thing, but can create objects with height. A typical home three-dimensional printer moves its print head over a bed, depositing molten plastic onto a surface layer by layer (with each of the layers being perhaps a millimeter high) to create something with length, width and height. (To picture it, imagine a hot glue gun on the end of a computer arm squeezing the glue out to create a shape). I put my son in charge of making some recommendations fora good printer and he found the Wanhao Duplicator i3. It's about $400 with mostly metal parts (many cheaper 3D printers are built with wood). It can handle either polylactic acid (PLA) or acrylonitrile butadiene styrene (ABS) plastic. This makes it a little more flexible than the cheapest 3D printer, but also more expensive. To print ABS, a printer needs a heated bed (the place where the printer deposits the plastic), because ABS tends to shrink when it cools and its necessary to keep the material as warm as possible while the printing process is ongoing. Cheaper printers do not have heated beds, which limit them to printing only PLA. PLA is great material for most projects, but does have some limitations. For example, it does not do as well if placed outside and it's not as strong or flexible as ABS. The original broken knob and the replacement before painting. The Duplicator i3 arrived in a large box a few days after we ordered it. My son assembled it in about an hour and it was ready for testing. There are two ways to control a 3D printer. The first is to connect it to a computer with a cable and then use software on the computer to control the action of the printer. This works, but means you need to keep your computer running while the printer is operating. Since a large print job can easily run 12 hours or more, this means your computer has to be on that entire time. While you can typically do other stuff on your computer at the same time it handles the printer, it also means that you can't stop or reboot your computer without bringing the print job to a premature end. A much easier way to control the printer is to have the computer write a file containing the print instructions onto a memory chip, then take that chip and plug it into the printer and let the printer get the instructions off the chip. The Duplicator i3 uses a micro SD card for this. In fact, it came with a micro SD card on which a file you can test print is already installed. Using a small bit of PLA that came with the printer and the file on the card, we were soon able to try out our new toy by creating a small model of a hand giving the "OK" sign in yellow plastic. At first t he printer is mesmerizing to watch. It consists of a flat bed, perhaps 10 inches square, that can move from the front of the printer to the back and vice versa. On either side of the bed are two support columns, each a little more than a foot high with a bridge at the top connecting them perhaps a foot above the bed. There is also another bridge between the supports that can move up and down. On the bottom of this second bridge is the print head. It can run left and right the full length of the bed. Since the arrangement covers all 3 dimensions, the print head can be positioned over the bed at every location and height in about a 10 inch cubic area. An early test of Bryce with the printer: the idea and the reality it created. As it works, it chugs along building layer after layer of whatever object you choose. At first it can be hard to tell what it's making, but as you watch it slowly brings whatever you created into existence within this 10-inch cube. The plastic to make the object comes in the form of filament that looks a lot like the stuff you use in your weedwacker. A standard spool weighs 2.2 pounds (1 kilogram) and is attached to a pylon on top of the printer's unmoving top bridge. As the printer uses the filament, it unspools and is sucked into the print head where it is melted and excreted out under the direction of the file of computer instructions. Because it can move the print head anywhere on the bed, in theory the printer can print any shape you can imagine. However, there are some practical limitations. For example, it can't start a print in mid-air. This means that if the object you are printing has large areas that overhang, the printer must put in supports under that part of the print. Usually this looks like a thin scaffolding. These supports can be somewhat problematic as they can make a bottom section of the object that should be smooth or detailed look rough once the supports are broken off. (One of the first things I built was a model of the Millennium Falcon that I downloaded from the web. The top looked nice, but most of the bottom was rough and bumpy from supports). Some printers solve this problem by printing two types of plastics. The supports are built with a type of material that is easily dissolved and washed away, leaving just the model. However, such printers tend to be much more expensive. The TARDIS printed from plans downloaded off the web. There is a large number of designs for objects that people have created and uploaded onto the web at sites like http://www.thingiverse.com/. This means that for many common objects, you don't need to do the designing yourself. I own an HO train platform and as a gag wanted to put a scaled-sized TARDIS (from the long running British TV show Dr. Who) on it. I had looked around for one the right size, without success. 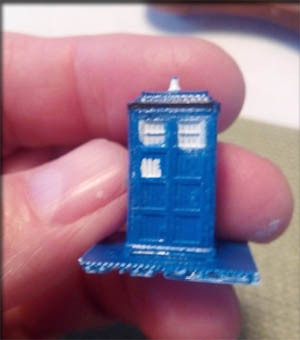 However, as soon as I had the printer working I was able to find a model of the TARDIS online, download it, scale it to the right size and print it. I only needed to paint it the proper blue color before placing it on my train platform. While there are a zillion items you can download and print, perhaps the best satisfaction from the machine comes from designing your own objects and printing them. For many years I've done computer 3D art using such programs as Bryce and Daz Studio. 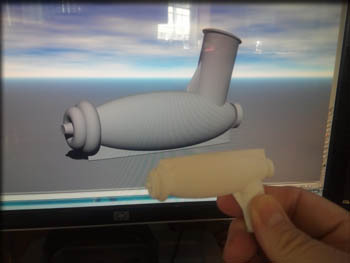 While I could produce interesting pictures with this software, the printer now allows me to produce real objects. One of the first things I designed and made, however, was a simple knob. A friend of my wife's had an older Subaru and the knob that controlled the hot/cold for the ventilation system had broken off. The price for a new one from the dealer was around $38. It occurred to me I could just design and print one. With 30 minutes of software work and an hour of printing, it was done. After a little black paint I was able to install it into her car and she no longer needs me to come out with a pair of pliers every season to switch the mode on her heater. My first large project was a ray gun. It's part of an art piece based on H.G. Well's War of the Worlds. It was designed using Bryce and consists of six parts printed separately. By designing a larger object as multiple pieces and printing them separately, you can make the object larger than the print bed can hold. This approach also keeps the printing times down and allows you to orient each piece when printed to avoid as many supports (and the problems associated with the bumpy surface they leave) as possible. While you could probably construct a ray gun using more standard techniques, the use of the computer and printer allow you almost complete freedom in design. 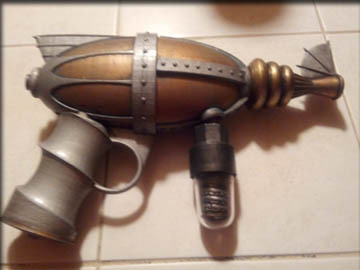 For example, the ray gun is designed to be held by a Martian tentacle and the grip as an indented spiral. While this would be difficult to make with regular tools, the printer can construct it just as easy as any other shape. 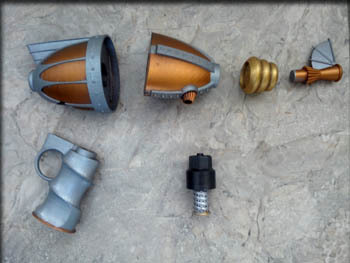 The ray gun as individual parts before assembly. While today the Wanhao Duplicator i3 and other similar printers are more of a hobbit's toy than a consumer product (they require fairly regular alignment and maintenance), it isn't hard to imagine a day a decade or two from now where a wide variety of objects could be printed by simply downloading the plans from a computer and letting the device create it. If you don't want to wait that long, there are certainly a number of 3D printers out there you can buy and experiment with. 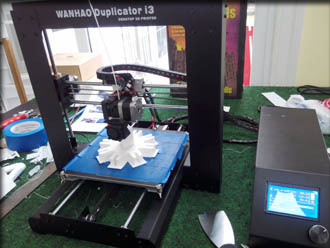 While I found the Wanhao Duplicator i3 a great product, it is possible to get 3D printers for as low as $200 (though you would be limited to printing PLA). There are also more expensive printers which give you such options as more speed and an enclosed printing space (this can be a useful safety option if you have kids as the heat involved in melting the plastic is significant, usually over 300 degrees Fahrenheit). While I used Bryce as my design software because I already owned it and was familiar with it, there are other 3D programs such as Autodesk 123D Design, Tinkercad and FreeCAD that can also do the job. Many of them are free. In addition to a design tool you will need a program called a slicer. The slicer takes the file containing the 3D object you create with the design program and creates another file with a set of instructions (gcode) that the printer can follow to build your object (It's called a slicer because it slices the model up into many levels that the printer will create one at a time). The slicer program can also rotate and scale the object as well as give you an estimate on how long it will take to print it and how much filament it will use. An example of a free slicer program is Cura. A standard reel of plastic (ABS or PLA) runs about $20 on Amazon and you can make a lot of objects with 2.2 pounds of plastic (The slicer software usually makes the objects hollow with just a crosshatching inside to give it strength). Even large objects rarely cost more than a dime in terms of materials. The plastics come in various colors (and also glow-in-the-dark), though I usually paint my creations. PLA is naturally clear (and you can buy it that way) but because the printer lays down one slice at a time you can't really make anything that is perfectly clear like glass with it, however. Such an object would be translucent. The gun in its final version. If you want to spend some more money you can get PLA which is mixed with particles of copper, bronze or even wood. While the resulting object made from these materials may look like those substances, and can even be polished, they do not have the strength of those materials, however. Even if you don't want to create an object from scratch, there are thousands of objects other people have designed and place online for download. So whether you are hankering for a statue of Cthulhu or a model of the rocket from TV show Fireball XL-5, it can be yours for pennies with your 3D printer.